If League of Legends were a mobile game, I like to think it’d be something like a slickly produced version of last year’s sleeper hit Flappy Bird: cute, charming, distressing at its difficult low points and dizzying at its high ones. 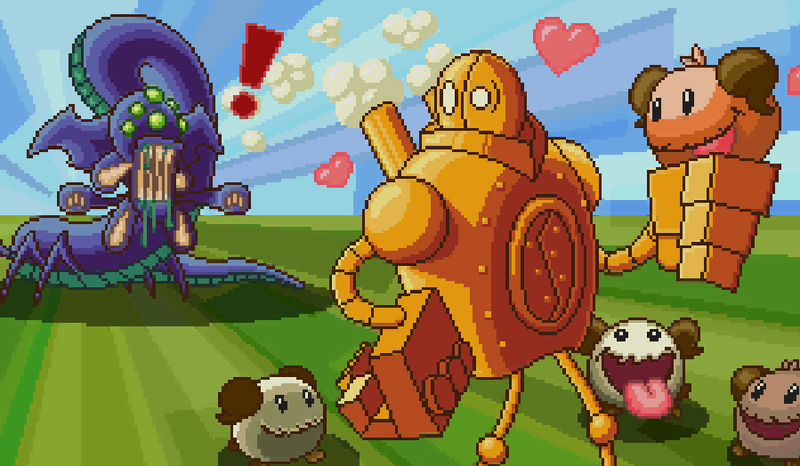 Riot probably feels differently about this, as evidenced by Blitzcrank’s Poro Roundup. And Battle Boss Blitzcrank, which makes the handsy mech champion look something like the bad guys Buzz Lightyear fights against in Toy Story. These are additions to one of League’s best champion skin lines, bringing the total number of arcade-ified League characters to six. Poros, for the uninitiated, are the cute little blobs of fur that appear on the League of Legends landscape every so often. They’re seen most often on the single-lane map Howling Abyss, where you can feed them cookies that they really seem to enjoy. As you and the poros run towards the right side of the screen in the new game, Blitzcrank can move up and down (with the directional buttons on the keyboard, or by tapping the top or bottom of the screen on a mobile device) in order to bump into poros that are slowing down—nudging them away from being eaten by baron. He can also use his trademark rocket grab to rope them in and deposit them safely inside the empty cavity at the center of his metallic chest. You can also unlock Thresh, Nautilus, and Corki as playable characters. Here’s Thresh (the one on the left) going against Katarina. You can download Blitzcrank’s Poro Roundup for Android or iOS or play it online here. Riot says that it will only be available for download “for a limited time”—though once you have it, it will stay on your mobile device until you delete it. I’ll be sure to download it on my iPad that still has a copy of Flappy Bird kicking around. Also one final note for League players: the two new arcade skins are on sale right now for 975 RP until August 24th. There’s also a “retro arcade bundle” available until August 27th that includes the Sona, Hecarim, and Miss Fortune skins for 2025 RP, or 3302 if you don’t own the champs already.